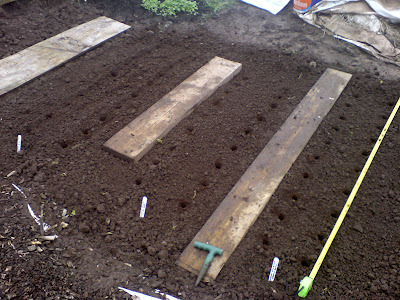 Broad beans, Turnips and Parsnips are the first seeds to be planted out for 2007. (Well...unless Karl planted something I don't know about?) 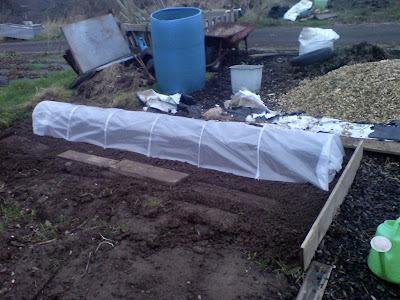 I've laid out 3 sections for broad beans where the tomatoes were last year. There's still a bit of space left for some more beans...french ones maybe? 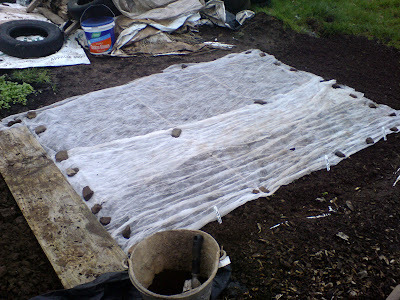 There were 2 types of bean that I put in: Bunyards Exhibition & Aquadulce Claudia. Turnips are planned for a nice early crop. I put in some Purple Top White Globe versions and covered them with a poly tunnel to keep them warm. 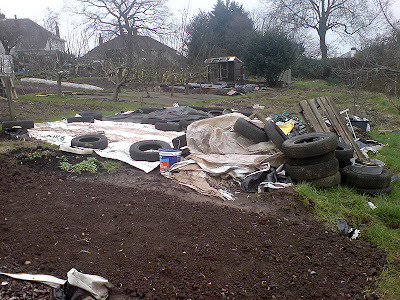 (Many thanks to Kay & John for the tunnel - a Christmas gift.) 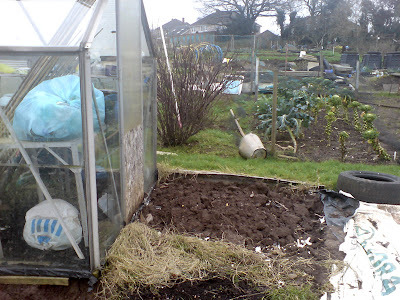 I've put the tunnel near the front of the plot where we had our poor sprouting runner beans and grass. 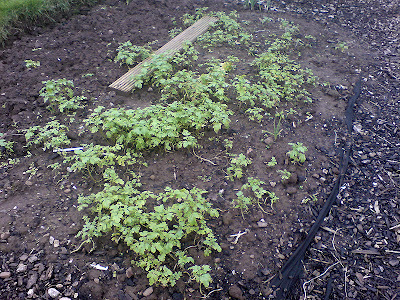 Last of all I put in some more parsnips by the greenhouse. 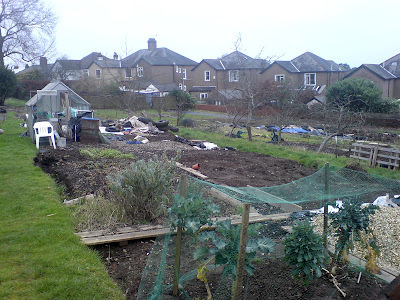 Karl had already dug in the mustard plants so the section just needed a bit of a rake over and levelling. I put in 2 types: Giant Parsnip & Hollow Crown. Can't wait to plant more!! 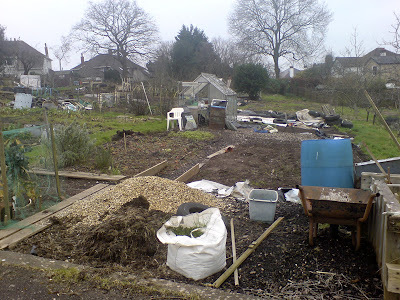 I've started to dig up the weeds at the back...getting there...sort of! 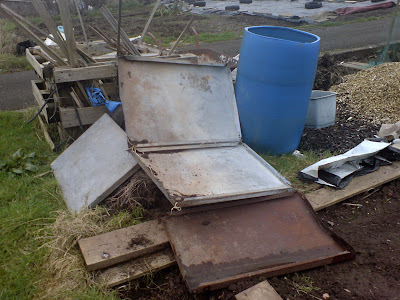 This is what the winds did to one of our compost bins a few weeks ago. 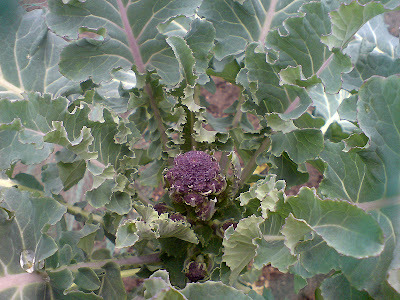 Is that a...no...it can't be....a Purple Sprouting Broccoli? About time!! Freshly dug and waiting for seeds! Mustard popped up and ready to be mixed into the soil. 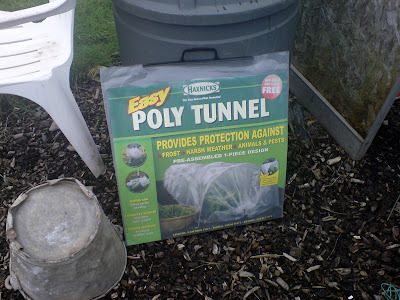 A gardener's joy...a poly tunnel!